There is something very sad when a historic event you actually lived to become national holiday. It is when the school kids see it as a chance to go to the mall and the adults to stay at home and get paid. For many and for many of my generation in Greece this has happened. One of the most heroic moments of our generation turned into national holiday aka public holiday and if the weather is good there are people going for picnics or if it falls around the weekend is a good chance for a brief holyday away from home. 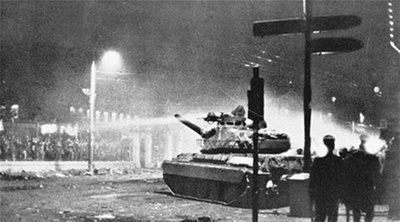 November 17th 1973 was the final day, the tank entered the gates of the Athens polytechnic killing and wounding students in a series of events that started with a students’ demonstration three days before. 41 years later the story in a very twisted way repeats itself. Back in 1973 the military dictatorship had already established its 6th year repressing Greece with an authoritarian regime that even forbidden Sophocles from schools because in his drama “Antigone” there is a reference to democracy. Thousands of Greeks either were in exiles, in small rocky island in the middle of the Aegean Sea, or abroad deprived any right to be Greeks, having lost their passports and endangering arrest if they would reach the Greek embassies abroad. The same time in Greece imprisonment, torture and arrests was a daily issue to anybody who would dare even to think something against the dictatorship. People would disappear and their families would hope that they were in prison or in exile and not dead. The stories we heard from these people when they returned after the end of the dictatorship were nightmarish. Most of them returned with psychological traumas that followed them till the end of their lives, a lot with physical wounds that never healed and most of them never managed to return to normal life. I have a personal anecdote that will follow me for the rest of my life. A very close friend who had lived the prison, the exiles and all the torturing one day was visiting me and my little nephew, a child 4-ytears-old was in that age where little boys attract attention by hitting the others. The problem with little boys is that they don’t know their power or how much they hurt the person they hit so my little nephew kept hitting my friend making me worrying that he was hurting. So loudly I asked him to stop and my friend turned with the most naïve and the same time nightmarish look and said to me “don’t, its long time somebody hit me and I miss it.” Please don’t take it as a declaration of masochism but see it as it is. And just imagine what this man went through. This was the situation until that November of 1973 when the students started demonstrating demanding bread – education – freedom. And it was like a forest fire that gradually made the whole of Greece to stand to the dictators and gradually kick them out of power. But those three days were the most heroic of my generation. 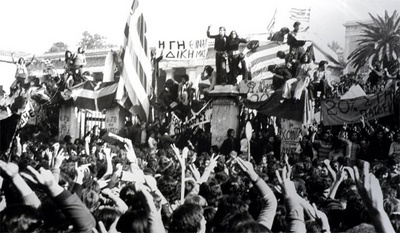 The uprising of the Athens Polytechnic was the uprising of the people who demanded democracy and they were ready to sacrifice their lives to get democracy back in the country where democracy had born. And they did give their lives. Among the dead there are high school students, 17 years-old kids. And they died when the police with the army attacked those kids that had locked themselves inside the perimeters of the Athens Polytechnic School. Please watch the following videos to get an idea what happened during those days. But the worst of all is that 41 years after the kids in Greece and unfortunately all around the world, they need exactly the same things as the kids in the Athens polytechnic and far more the Greek kids. In an era where our rights are sacrificed in unemployment and in the name of economic growth, where our education is sacrificed in the name of new wars and liberties in the name of anti-terrorist laws, nothing could be more temporary than demanding bread – education – freedom. And there is nothing festivity about the Athens Polytechnic anniversary, there is universality in its message. Quite right Thanos, those sad events ought to be commemorated but not celebrated. People confuse the two nowadays, and that may be due to the fact that the line between what is honorable and what is shameful has been considerably blurred. That may be just as dangerous for the flourishing, and indeed the very survival, of any civilization as the repression of freedom and democracy. Sir, thank you for this Heartfelt and Mindful Commemoration of the events at the Athens Polytechnic School in 1973. And Brother Emanuel is quite right about the Modern World's blurred lines between what is Honroable and what is Shameful, and what is to be Respctfully Commemorated and Festively Celebrated.